The leader of Germany's Social Democrats (SPD), Martin Schulz, has abandoned a plan to serve as foreign minister in a new coalition government. A deal to govern with Chancellor Angela Merkel's conservatives still has to be put to a vote of SPD members. Mr Schulz, facing criticism inside the SPD, said he did not want debate about his role to jeopardise a new coalition. The centre-left party is on course to run six ministries, including finance and foreign affairs. 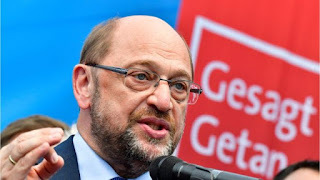 "I hereby declare my decision not to join the federal government and at the same time I sincerely hope that this will end the personnel debates within the SPD," said Mr Schulz. German media report that SPD members in the state of North Rhine-Westphalia were especially opposed to Mr Schulz - formerly European Parliament president - becoming foreign minister. Tensions are also reported between him and Sigmar Gabriel, an SPD colleague who is currently foreign minister.